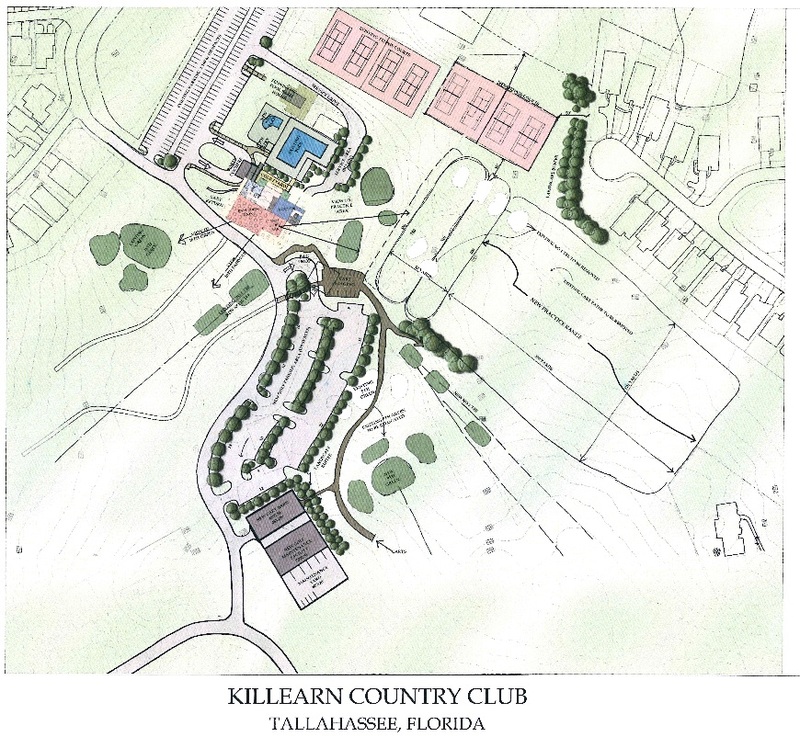 Tallahassee Reports has obtained drawings of the proposed renovations for the Killearn Country Club. The drawings, provided below, come nine months after a controversial process that culminated with a decision by the City Commission to allow the owner, Barton Tuck, to move forward with a redevelopment plan. Back in April, TR reported that permits for the residential development would be in hand by January 1, 2018 and by the end of 2018 the first homes would be built and the clubhouse construction would be near completion. We hope to have more information on the timing of the redevelopment in the near future. The drawing below shows the relocation of the driving range and the moving of the 18th green. It appears the pool will remain in the same location and a new tennis, snack bar, and bathroom facility will be added. The new clubhouse will be located where the current locker room and 19th hole restaurant currently reside. The floor plan of the two story clubhouse shows a ballroom with seating for 200, a kitchen and an outdoor patio upstairs. The lower level contains the golf shop, a fitness center/room, locker rooms and an eating area. 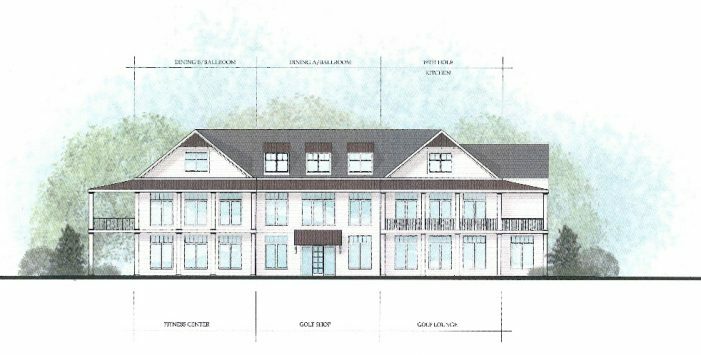 4 Responses to "Killearn Country Club Releases Drawings for Renovation"
Wondering if the permits promised by January 1st have actually been received. I am certainly not a construction expert and I’m wondering it that structure will be completed by the end of 2018. Any idea of who the general contractor will be for both the homes and the clubhouse? 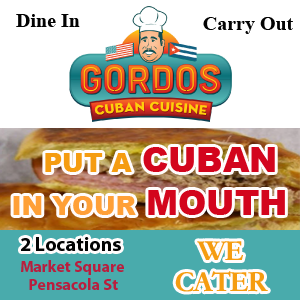 Thanks for keeping us up-to-date on this! At one time I had some high hopes for the new planned home-townhome development on part of the old Killearn golf course. But it’s my understanding that J.T. Burnette (who bought the 35 acres that were to comprise that development) is one of the named persons being looked over in the FBI’s investigation of the CRA and the COT. So Mr. Burnette might be occupied with other activities rather than concentrating on the proposed development in Killearn. Sad – maybe J.T. comes out of it only having to testify and not ending up as a defendant or accessory to any CRA crimes, and the development continues. But I’m not making plans on house-hunting there anytime in the near future. And I fervently hope all the COT officials-staffers and the CRA personnel are found profoundly guilty, along with any developers or businessmen who were complicit in the culture of corruption that permeates City Hall. Remember when the members voted to close the north in exchange for a tpc sawgrass clubhouse? And how is this new building progressing?